Students from Career Academy in Lowell riding new bikes and wearing new helmets. 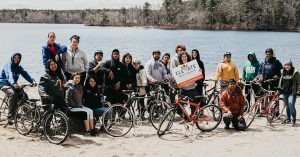 Though snow fell this week, students from Career Academy in Lowell still managed to make the most of school vacation, fitting in a bike ride to Heart Pond in Chelmsford. This was a special ride because students were pedaling new bikes – and wearing new helmets. Breakstone, White & Gluck was pleased to donate the helmets from our Project KidSafe campaign. The idea for the bike ride began with Bernice Chandler-Petrovick, who teaches biology. Some of her students needed bikes to get to school and travel more independently. She began teaching students about bicycle safety while also setting out on another goal: finding bikes for her students. Then she found Elevate New England and Breakstone, White & Gluck. Elevate New England is a Lowell-based mentoring organization working with students and schools. The organization gathered used and new bikes, then refurbished the used ones like new for students. Students can expect to hear more about bicycle safety at Career Academy. Chandler-Petrovick is now working to build a bike rack so students can safely park their bikes at the school. She hopes to expand the bicycle donation program next year. Breakstone, White & Gluck launched our Project KidSafe campaign in 2013, with a goal of protecting children from head injuries. Over the past six years, we have donated over 20,000 bicycle helmets, in partnership with police departments, schools and community organizations. Wearing a bicycle helmet is the most effective way to protect one’s head if they fall on a bicycle or are involved in bicycle crash. Though millions of Americans ride bikes, fewer than half wear bicycle helmets, according to the Centers for Disease Control and Prevention (CDC). Many states, including Massachusetts, have laws mandating bicycle helmets for younger cyclists. In Massachusetts, you must wear a helmet if you are 16 and younger. However, all cyclists are encouraged to wear helmets for safety and to prevent concussions and serious long-term head injuries. If you are a parent, make sure everyone in your family has a helmet and they properly fit. Have your children wear one as soon as they get on a bike and wear one yourself so they will follow your lead. Make sure your helmet is in good working condition. The helmet needs to be able to absorb an impact should you fall. Replace your helmet every few years at a minimum. Resist the urge to pass helmets down between siblings or friends. Helmets are expensive so we know this may be tempting. But you want to make sure the helmet is fit to protect you or your child.